A troublesome cough led Patty Reid on a nine-months-long medical odyssey that resulted in a diagnosis of non-Hodgkin lymphoma (NHL). Just as the then-60-year-old was preparing for a stem cell transplant in late 2016, a new research discovery prompted her doctors to change the type of transplant Reid received—greatly lessening her risk for another cancer in the process. For Reid, an Atlanta native and resident, it was a true bench-to-bedside experience. Because her lymphoma was a rare, stage IV blood cancer, her Georgia oncologist recommended she seek a second opinion from Eric Jacobsen, MD, clinical director of the Adult Lymphoma Program at Dana-Farber/Brigham and Women’s Cancer Center (DF/BWCC) in Boston. Jacobsen initially noted that Reid would best benefit from an autologous stem cell transplant, in which her own stem cells would be removed, frozen, and then reinfused after intensive chemotherapy to put her lymphoma into remission. So Reid planned to temporarily relocate to Boston with her husband, Doug, for the lengthy treatment and recovery process. Jacobsen’s colleague Edwin Alyea, MD, who is a transplant physician in the Adult Stem Cell Transplantation Program would be performing Reid’s transplant. 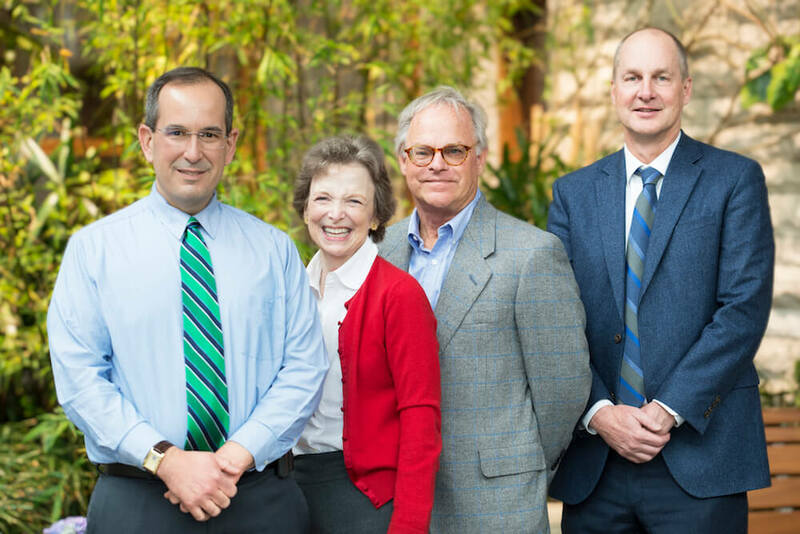 Left to right: Eric Jacobsen, MD, Patty Reid, Doug Reid, Edwin Alyea, MD. Meanwhile, using a new technology and in collaboration with the hematologic malignancy and stem cell transplant teams at Dana-Farber, physician-scientists Christopher Gibson, MD, and Benjamin Ebert, MD, PhD, were making an important discovery: A significant percentage of NHL patients undergoing autologous transplants carry acquired genetic mutations that increase their risks of developing second hematologic cancers and dying from other causes, they found. The mutations were found in 30 percent of 401 NHL patients, each of whom had blood sampled at their time of transplant. Patients older than 60 were more likely to carry the mutations, which occurred in several different genes, and were acquired, not inherited. In December 2016, the same month the Reids visited Patty’s team in the Stem Cell Transplantation Program at DF/BWCC to discuss her transplant, Gibson and Ebert’s findings were presented at the American Society of Hematology (ASH) annual meeting. Armed with this new knowledge, Jacobsen and Alyea decided an allogenic stem cell transplant—which requires stem cells from a donor—would be a safer option. Learn more about non-Hodgkin lymphoma from Dana-Farber Cancer Institute. That winter, a donor was found for Reid, and in March 2017 she had her transplant. During the next four months, during which she was immuno-compromised and closely monitored, she rarely ventured outside the apartment she and Doug rented near DF/BWCC. Now, when the couple makes Boston visits for Reid’s six-month checkups, they make time for sightseeing and trips to the theater. Patty is feeling great as well as grateful, she says, and to show their appreciation, she and Doug made a substantial philanthropic gift to Dana-Farber to fund collaborative research by Jacobsen and Alyea. “The Reids’ generous gift will help us immensely in our efforts to better understand the biology and further improve the treatment of this rare group of diseases,” says Jacobsen. There you have it, the best of the best: Dr. Jacobsen and Dr Alyea at Dana Farber. Patty looks wonderful and healthy. I’m happy to read about people like Patty who have gone through transplant so successfully. I’m 6 months out and have never felt better. Thank you Dana Farber and Doctors Eric Jacobsen and Edwin Alyea!